The Dyamonde Daniel series by Nikki Grimes features an in-charge and lively girl name Dyamonde (pronounced “Diamond”) who is confident in who she is. They’re really short chapter books that can be read in one sitting. The opening book, Make Way for Dyamonde Daniel, was about moving to a new place and making friends. It was simple and good. 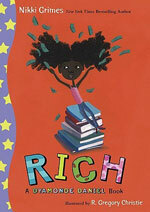 The second book, Rich, was surprisingly sweet. A poetry contest is announced at school, and while Dyamonde isn’t interested (math is her subject), her friend Free thinks he can rhyme with the best of them. Dyamonde makes a new friend who is also interested in poetry, Damaris Dancer. Damaris lives in a shelter after her mom lost her second job and couldn’t pay the rent. She embarrassed and trusts Dyamonde to keep her secret. For some reason I keep coming across fiction stories about homelessness (like 8th Grade Super Zero) and I’ve been impressed at the way it’s presented with dignity and grace. It’s too easy to rely on stock characters, easy answers or some kind of savior complex. But Dyamonde is a true friend to Damaris and it offers a powerful example. Plus there’s some good poetry and a nod to poet Eloise Greenfield and her book Honey, I Love. I know nothing about the poet or the book, but it’s always fun when books point you to more books.